Information Analyzer uses advanced algorithms and machine learning to help identify columns with personal information, other sensitive data and critical data elements that may need to be a part of a GDPR (General Data Protection Regulation) data strategy. With support for multiple analytical reviews and asynchronous profiling, a project-based collaborative environment allows more than one user to work in a project-based context. You can specify which users can access the project and which actions they can perform. Users can view project data, review analysis results, enter annotations and run analysis jobs helping them to understand the meaning, structure, and content of information across a variety of sources. A methodology and best practice guide is provided for designing data quality rules to perform trending, pattern analysis and establish baselines consistently over data sources. The pre-packaged data validation rules help to reduce overall development time. Analysis and monitoring provides source system profiling and capabilities to help you classify and assess your data. Users can classify data, display data using semantics, validate column/table relationships and move to exception rows for further analysis. 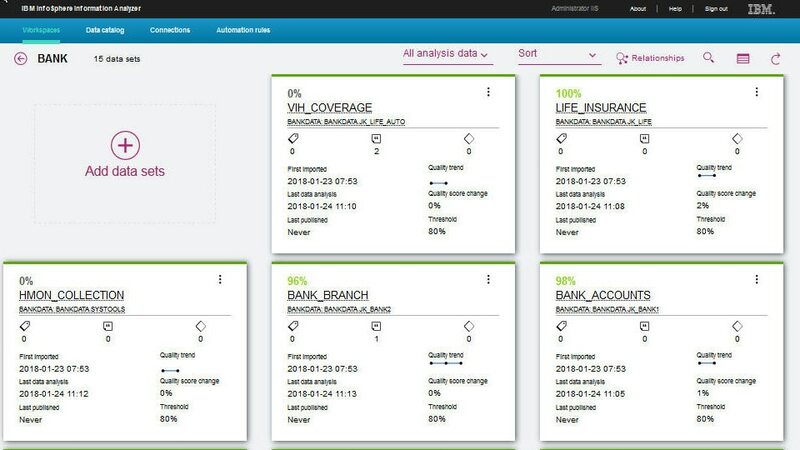 Anlayzer uses the IBM Information Server scheduling service for scheduled execution of profiling, rules and metrics and provides auditing, tracking and monitoring of data quality conditions over time to support data governance initiatives. InfoSphere Information Analyzer uses open database connectivity (ODBC) or native connectivity to profile IBM Db2®, IBM Informix®, Oracle, Microsoft SQL Server, Sybase, Microsoft Access, Teradata and other data sources such as text files. It allows for reuse and sharing of data rules in IBM InfoSphere DataStage® through IBM InfoSphere QualityStage® and Information Analyzer to help align data quality metrics throughout a project lifecycle. Supports multiple languages including English, Chinese (simplified and traditional), Japanese, Korean, Spanish, Portuguese (Brazil), Italian, German and French.